I had lunch today at Danzi Kitchen in Taipei with Kuan-min Chen and Yu-sen Lin, two well-known Chinese wines writers. Said to be famous for its Taiwanese 'tapas', this was certainly a charming way to spend an otherwise cold and drizzly morning. Kuan-min, or Vivienne for those of us who stumble over Chinese names, brought along a bottle of 1999 Champagne from Robert Dufour. 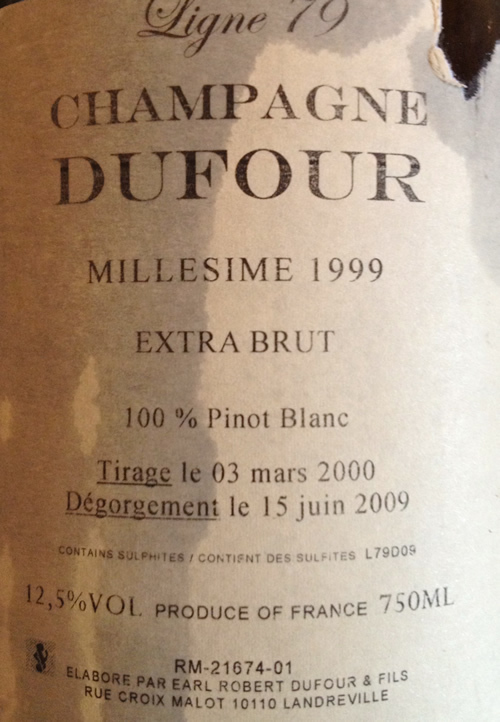 It was the first pure Pinot Blanc that I had ever tasted as a notorious 'French bubble'. Humorously, the Champenois call the varietal 'blanc vrai' as if Chardonnay were an usurper. Along with Arbane, Petit Meslier and Pinot Gris, it is one of the four 'other' varietals still allowed by law, but that together make up only 0.02% of the total vineyard area. I know that Cedric Bouchard also makes one, but have never tasted it. This bottle did not win any raves from the always critical Yu-sen, who thought it tasted like - in spite of being disgorged eight years after bottling - apple cider. Perhaps that is why Pinot Blanc is no longer widely used in Champagne.